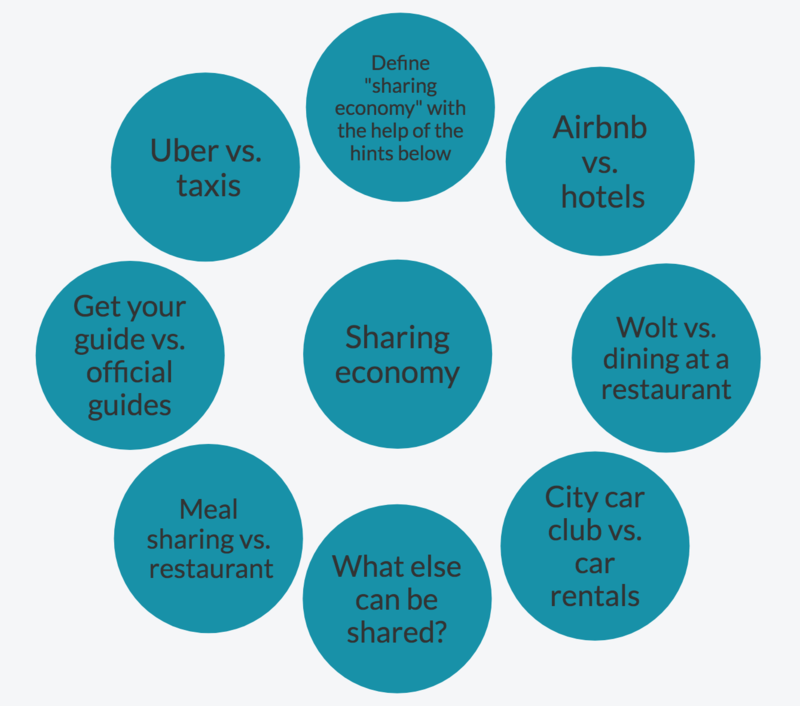 1 M16: Okay... mm... Air- Airbnb versus hotels... I've never heard of Airbnb. 7 M16: //Yeah [laugh] yeah it's// hard one. 9 M16: //Wolt versus// dir- di- dining [laugh] at a- er restaurant. 19 M16: //it's sort of-// they have all sorts of food. 30 M17: //Here's// Wolt versus dining in the restaurant. I think it depends on the situation. 32 M17: Cause if you feel like "Damn I want to go out." 37 M16: //So it d-// depends a bit on the situation. 40 M17: City car club versus rental cars. 49 M16: and I think it- it worked well... and... everything was great... but... I dunno erm it's a... maybe it depends on the company that... rents the cars. 50 M17: Oh yeah... but I think it's- it's a- it's a bit risky probably. 51 M16: Yeah it might be. 52 M17: Err... what else can be shared? 57 M16: //I think...// Do we have culture here? 58 M17: Mm eh... In Finland? 59 M16: You but in- [fin]no[/fin] in this mind map. 63 M16: still [cough]... mm... [laugh] I don't think if we can even strike up a con- conversation about it. 64 M17: Mm... seems like it... Erm. 65 M16: What about meal sharing... versus restaurant? Erm... meal sharing? 78 M17: //if you do it// all the time it's really expensive. 94 M17: //go on my// own. 99 M16: so on, so. 104 M17: Me too, me too. 105 M16: And then there's Uber versus taxis, it's the last one. 107 M16: //Yeah// me neither. 108 M17: Is- is it er, well it is illegal. 109 M16: It's i- it's illegal in Finland. 110 M17: Is it erm... is it cheaper than a taxi? 113 M16: a lot of- er it's- it's really she- cheap. 114 M17: Yeah and er I guess it's pretty easy to get also. 126 M17: But it's also... if you e- if... you'd get an Uber... and er... you know you wouldn't get er do y- if- if you get caught using an Uber, do you... get a fine? 140 M17: cause... you get- you get a cheaper- I think if you get a... er... like... y- you need a ride home from the railway station, it's like er for me it's 25 euros. 150 M17: I would take it. 151 M16: Yeah... I think we're done. 152 M17: I think we're done yeah.